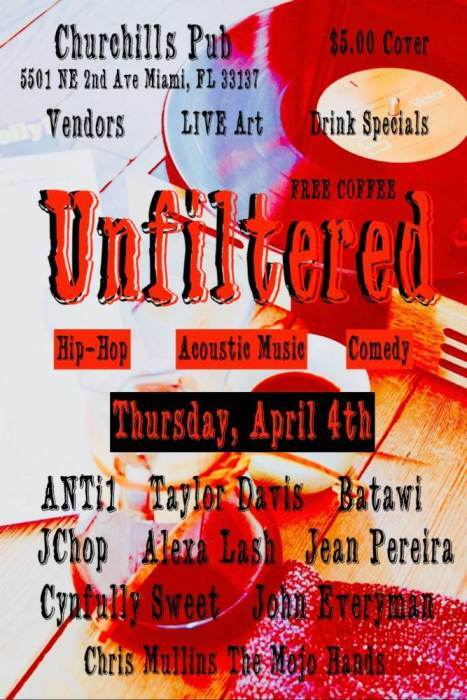 Unfiltered with Batawi, Taylor Davis, ANTi1, JChop, Alexa Lash, Cynfully Sweet, Chris Mullins of "The Mojo Hands", Comedian John Everyman & Jean P.
Join us Thursday April 4th for the 1st Unfiltered Show of 2019 at Churchill's Pub. FREE COFFEE, Stage full of a mixture of Genres, Vendors, LIVE Artists & amazing drink specials. Please join us for this amazing local community event bringing together Folk Music, Hip-Hop & Comedy all on one stage in an event like no other. Batawi, Taylor Davis, ANTi1, JChop, Alexa Lash, Cynfully Sweet, Chris Mullins of "The Mojo Hands", Comedian John Everyman & Jean P. For more information follow on social media Churchill's Pub or @taylorjamesdavis on Instagram. See you soon!